This article is about the British actress. For American model/actress, see Katie Johnson (American actress). For the personal secretary to Barack Obama, see Katie Johnson (personal secretary). Bessie Kate "Katie" Johnson (18 November 1878 in Clayton, Sussex, – 4 May 1957 in Elham, Kent) was an English actress who appeared on stage from 1894 and on screen from the 1930s to the 1950s. In 1908 she married the actor Frank Goodenough Bayly (1873 – 28 November 1923, Newcastle upon Tyne). 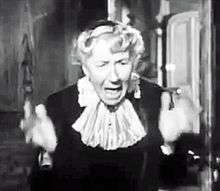 She first appeared in a film at age 53, in 1932, but never received critical acclaim for her performances until 1955, when she starred, aged 76, in the Ealing Studios comedy The Ladykillers as Mrs Louisa Wilberforce. The role earned her a British Film Academy award for best British actress. She died less than two years afterwards having only appeared in a single further film. She also appeared in the BBC science fiction serial The Quatermass Experiment (1953) and played a spy in I See a Dark Stranger (1946).